Do you drink enough water? There’s no clear answer as experts have different opinions. Eight glasses of water daily is the simple answer we have all heard of. Other say we should drink between half to one oz for each lb you weigh (so if you weigh 130 lbs, you should drink 65 to 130 oz; in cups that’s about eight to 15 cups, which is a pretty big range!). It depends on many factors, including your activity level. One simple way to gauge if you’re well hydrating is to check the colour of your pee; pale straw to honey colour is good. Anything darker or clearer could be a sign you’re dehydrated (although darker colours may also be a sign your liver isn’t working optimally). Drinking enough water is important because it helps your body run more efficiently. For one, it helps keep you regular. Also, it may help control your weight; if you’re feeling a sense of hunger, it might actually be your body telling you you’re dehydrated. Grab a glass of water instead of the snack you would’ve gone for and, hello, your craving is gone without having consumed any calories. I know I’m not hydrating enough. I typically drink one coffee a day (and caffeine is dehydrating) and then a juice with lunch and dinner. I tend to only drink water when I’m running. Friends who’ve travelled with me have asked how I’m still alive having witness how little I drink. For about six months when I was training for half-marathons about six years ago, I did focus on hydrating well, but then fell out of the habit as I didn’t notice any obvious changes (I also gave it up because the numerous bathroom visits were driving me crazy). But I know it’s time to get on the hydration bandwagon. 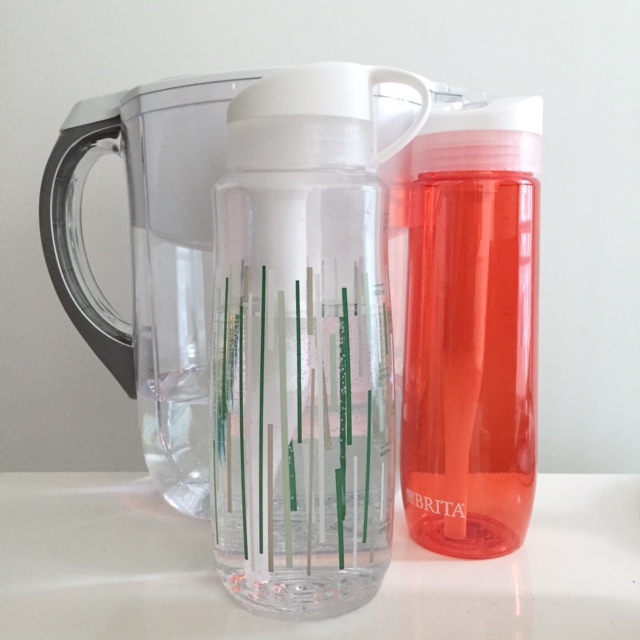 And equipped with a shiny new Brita pitcher and water bottles, I’m up to the task and doing a #BritaBootcamp! There’s a new one-litre bottle; the bigger size is helpful when you’re on the go so you’re less likely to run out of water…so no reason any of us (even me) for not doing well in #BritaBootcamp and getting the hydration we need. Need motivation to get your hydration on track? Enter my #BritaBootcamp giveaway! Email me at healthandswellness@gmail.com with your name and address (please put “Brita Bootcamp” in the subject line). Instagram: Follow me on Instagram (@healthandswellness) and like the photo of the Brita water bottle on Instagram, and comment how much water you currently drink daily. This giveaway is open to Canadian residents and you can enter up until 4 p.m. EST, Thursday, May 7, 2015. The winner will be chosen at random and notified via the method they’ve won. If they do not claim their prize within five days, another winner will be selected at random.